The three year old class will go Tuesday and Thursday (two days a week) from 8am to 12:30am. Monthly tuition will be $130 with discounts available. The preschool students will have breakfast in the classroom. After preschool care will go from 12:30 to 3:30 with lunch and a snack provided. The 4 year olds will go Monday, Wednesday and Friday (three days a week) from 8am to 12:30. Breakfast and lunch will be provided. Monthly tuiton is $180 with discounts available. After preschool care will go from 12:30 to 3:30pm with snack provided. Discounts will be based on income eligiblity. Forms are available in the office. NO COST FOR BREAKFAST AND LUNCH! Both classes are limited to 20 students. Is there bussing available? No, not at this time. The state requires seat belts for students four and under. 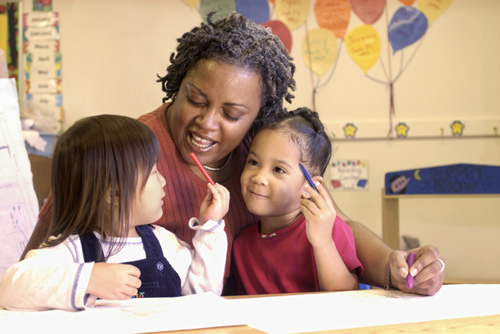 Is the after school care included in the cost of the monthly tuition? NO! After preschool care will be $3.75 an hour plus the monthly snack/hold your spot fee. We have to hire an employee for this position. No discounts are available for childcare. Why do I pay the same amount of tuition in December as I do in September when my child only goes for two weeks? To figure out the price of tuition we counted up the days and hours the student is in school and multiplied it by $3.75 and then divided the number by the months your child is in school. The students will be in school 99 days for 4.5 hours. 99 days x 4.5 = 445.5 hours (445.5 x $3.75 =$1,670.63) That amount is divided by 9 months for the cost of tuition. What if my child is sick and misses days? The tuition holds your child's spot in class. There are exceptions for special circumstances. What is the cost of breakfast and lunch? This year, 2018-19, breakfast and lunch will be free! There is no additional cost for meals at Dufur School this year! *When enrollment information for 2018-19 was mailed out, I did not know the breakfast/lunch program was changing.